Best money I’ve ever spent on an app, it’s so awesome you won’t be disappointed we like to turn it on in the mountains when we’re camping !! The update says Farout was added. But it wasn’t. The best app you could have .. It is accurate and easy to use. What else is there to say. This app is totally complete and everything you’ll need for you stargazing experience! A must have to enrich your love of the universe!! This app was hands down the best app ever. It brought space to our hands. I don’t know what changed, but there hasn’t been an ISS alert on my phone in over 6 months. Or any other piece of flying space junk. I’ve verified this with other users of Skyguide. They’ve stopped. It was crazy cool to watch things fly by. So sad. I’m crazy about this app. Love the way it navigates the sky, showing all the visible and invisible constellations. I’m constantly referring to it. Is there a setting we’re I can look at the sky with my phone. It can help you locate planets, stars, and MORE! I am so tired of the app not updating. My phone has been trying to update the “bug fixes” update for months. Uses data and battery power constantly. Quite frustrating. Please respond with a fix to this problem. Thank you. Otherwise, I have been happy with the app. My favorite of 7 sky apps I own! Love this app. It’s user friendly. It’s beautiful. It’s incredibly (and interestingly) informative (but easy to navigate while getting access to all that amazing info!) It’s easy to find what I want in the sky and what’s not actually in my sky at that moment (but when it will be or when I missed it already). The augmented reality is kinda fun (but not often used by me to date)... To pack soooooo much into something so beautiful, informative, and easy to navigate is apparently quite a feat... as my other sky apps lose points on at least one of those key components... (and some more than one)... Hands down my favorite! Hey devs, love this app and I use it daily. Could you please add an option to fine tune the auto compass? It’s not precisely aligning so an option to offset it a few degrees and then remember that would be awesome! Update: Feature is there, I just didn’t know how to access it!! I’m really enjoying this app,IHave fun with this, showing my grandchildren the space shuttle and stores that we can see. I wish the app was more detail and if there’s an update I would like to get it thank you very much. The information at my fingertips used to take me hours to uncover. I love when my students say “Mr. C what is that?” And I can answer them instantly! Thanks! So much fun and a great way to spend time with friends outdoors stargazing. We modern humans live in cities with light pollution and spend most of our time indoors. We have lost our connection to the night sky. 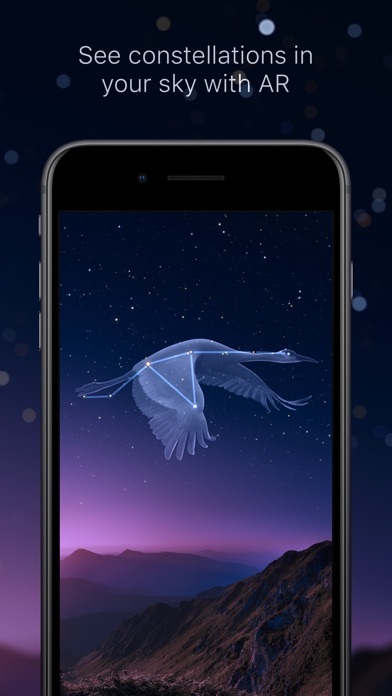 This app will help you find wonder and awe in the sky. It’s the best astronomy app! This app is a great help to learn where to look for constellations and other celestial happenings. I absolutely love this app! It brings you directly into space! Such an awesome app. Great for photographers as well as sky watchers. I hope one day my kids can contribute to space. Life has no limits and boundaries. The compass is not accurate. What a disappointment. Makes lookin at the stars so much easier! What happened to the notifications? This app is beautiful & is one of my faves, but even with all of my notification settings turned on from my phone & the app, I never receive any. I’ve tried everything from re installing the app, to restarting my phone. I’d love to get notified when a satellite is passing by. Is this a bug that can be fixed?? I’ve always found space and science especially interesting, and this app is my favorite app by far. I am always on it learning new things about space, and also, if I see something in the sky irl, I can take this out, look at it, and I will then know what I’m looking at. It’s super cool. This is one of my top 3 favorites. It was recommended to me and then everyone I’ve recommended it to has also gotten it. The information you get from just touching one star is incredible!!! Awesome and beautifully designed. Works great on my iPad. Highly recommend it. This app has helped me see the universe in a vast new way that I could never imagined before. Not only has it given me more knowledge on our beautiful universe, it also gave me some of the best memories star gazing with my friends. So I would 100% recommend this app because it not only will give you reliable knowledge on the topic it is based in, but will also make memories that will last a life time. Also it’s has some of the best music from any app just felt like putting that out there. I’m done now. If you have any interest in the stars, planets or the universe. This is the best. I watched the Great American total solar eclipse in 2017. I relive it whenever I want on this app. I go to the location on the map, the time and date of August 21, 2017, and there it is. Everything from Bailey’s Beads to the corona is perfectly rendered. You can even zoom in. I even wanted to view an annular solar eclipse, so I googled a bit, set the location to the border of Mali and Mauritania on September 1, 1951 and sure enough, it was shown as an annular, not a total solar eclipse. I look for the planets in my light-polluted backyard. The app helps me distinguish Antares from Mars. It tells me what is Saturn and what is Arcturus. For fun, I speed the sky movement up to 10 days a second to watch the planets spin around the sun. I have seen no other app or any other anything able to perfectly visualize the skies like that. It is a window into both Ptolomy’s view and Galileo’s all at the same time. I even see Mercury go dim when it is between Earth and the Sun and bright when it is on the far side of the Sun. I speed the sky movement to 60 days a second, select the sun, and watch it do figure 8s in the sky. I go to Alaska on the location and watch the Sun disappear for months beneath the horizon. I even decided to test the numbers and go to the year 2600+ to see if the precession of the equinoxes is rendered in “the Age of Aquarius,” and sure enough, on March 20, 2660, the Vernal Equinox sun breaks the horizon exactly east — not in Pieces — but in Aquarius. Even Axial Precession is rendered correctly in 600 years. It is rendered flawlessly. And that is freaking amazing. Ridiculously user-friendly. It’s hard to improve. (Except for an easy way to both set the particular time of day when i want to speed to 10 days per second. With a bit of practice, I can get it, but that’s literally all I can think of.) Get this app. It’ll change your life. Cool app. Gives accurate location on the stars and the moon. Along with gives additional information about the stars, moon, and other planets and how’s its aligned when you glance at the sky. Highly recommend for star gazing. I’ve tried all the night sky apps on the App Store and this is by far the best. Not only is it the most drop-dead gorgeous, but Featured (the news feature) is also informative and just as pretty as the rest of the app. 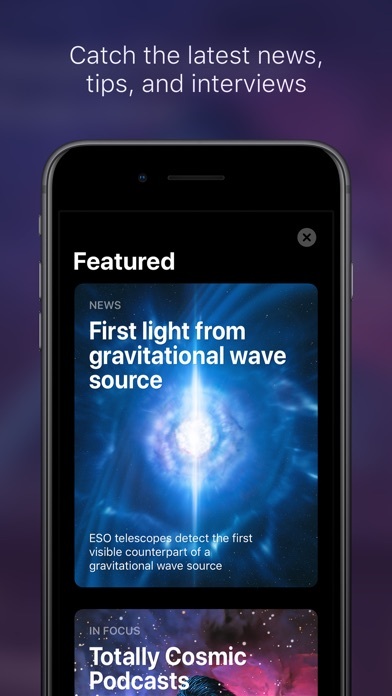 Not only does it have good, short articles about astronomical phenomena and skygazing tips, but it also has a monthly “The Sky in [Month]” articles that give you the highlights you can go outside and view for the month, with targets like planets hyperlinked such that when you tap them, the sky map rotates to bring those heavenly bodies into view. Nice! Supermassive is cool, too, though I haven’t used it much, so I’ll leave that to other reviewers. I just had to write a review right now because I saw Apple’s editorial about the app in the App Store just now and was irked at how little they said about it. This is a must-have app for anyone serious about astronomy or who just wants to have fun learning more about the universe. I love this app so much. My daughters name is Lyra and it’s awesome to get to show her where the constellation is. When she’s older I will share with her the facts and the story behind Lyra. It keeps me informed. Love the additional choices for observing Up close our extraordinary universe. Awesome! Been trying to update this app on my i pad since Jan 20. It is still trying to update. Wrote the developers weeks ago but got no response. I love night sky gazing and obviously I recognize the moon, but not much else. On a recent early morning, there was a bright star??? just beneath a quarter moon. Even lower to the horizon was an even brighter and larger object, which I guessed was Venus. Sky Guide confirmed it was Venus and right below the moon was Jupiter. It also outlined constellations. When I returned to the house, I found it worked inside! And pointing my phone towards the ground showed me what people on the other side of the world were seeing in their sky! How cool is this! First off: I tried to find something critical to say, because I don’t usually believe 5-star reviews...I couldn’t think of anything. I have had this app for a while now (years), and I have really enjoyed being able to quickly identify any bright object in the sky that catches my attention. What I didn’t expect, but have also enjoyed, is the large amount of information on each object that is offered just by tapping on it. As someone who isn’t even a stargazer, I find myself getting sucked in almost every time. This is a magnificent application. I’ve never paid for a premium version of an app before this one. It is beyond worth it for the advanced version! I am not notified when space station is going to pass my location? Thanks for your time. Brightness is adjustable. Location aware. Helps find phenomenon through partly cloudy and light polluted skies. Includes natural and artificial bodies. I love this app! My only question is the alerts for the ISS Passover seemed to stop coming through just before Christmas. I’ve checked all the settings on my phone and it says I’m still allowing this app to send me notifications, but I haven’t gotten any for a couple months now. I check with a friend who has the app and she’s having the same issue? I love the app and used to rate it 5 stars. However, my favorite thing about it, the space station alerts, have not been working for quite a while. I haven’t gotten a single alert for months; even when I get an email from nasa that it is passing over my area. All of my settings allow notifications. I’ve even uninstalled and reinstalled. When that’s fixed it will be back to 5 stars. Great teaching tool for the family. The best star app. Easy to use, great graphics, and lots of information. Download and enjoy. All you need for epic star gazing experience. Fair price. Buy it! Add a feature that tells what type of moon it’s going to be at night. As much as I love this app, I don’t receive sound notifications anymore. I have every notification from app to mobile turned on, yet no notifications. I love watching the Space Station go overhead but I continually miss it due to no sound notifications ahead of time. If this worked, I’d give 5 stars. I’m on an iPhone XS Max. Night or day, it’s fun to see where the stars and constellations and planets are. Great app. This was a great app till the compass went out of alignment. Probably needs to catch up to the magnetic pole shift. I have tried several different sky apps and this has to be one of the best . The simple but realistic and attractive graphics, the ancient historical meanings behind the constellations the names of the stars, the ethereal music, now the blog. The music is so relaxing sometimes i just let it play in the background and my mind goes on a journey. Love this relaxing and educational app. I feel like I am traveling through the universe. Seeing the night sky through this app is incredible! I’ve learned so much about constellations, where the space station is and names of stars. Love This!! I Use It At Night, In Bed, Music Relaxes Me! Excellent App! Amazing to find an app that works so well and provides such detail and value! I use Sky Guide all the time and whenever I show it to others they instantly want it to! I have had this app since I got an iPhone . I love it so much when I'm out on the beach or wherever and I see the sky I use the app to see what's around me. Love. This app has way more features than I thought! 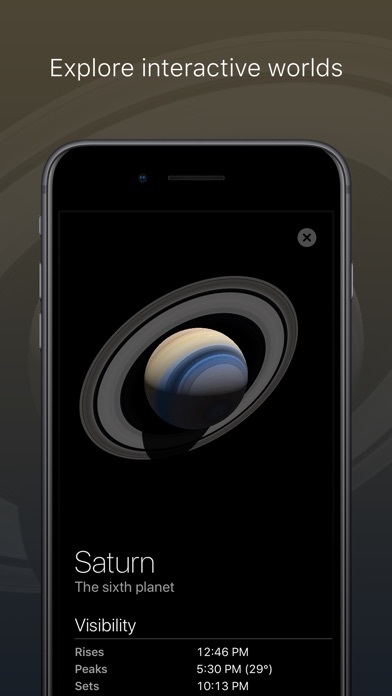 It’ll show you the names of stars planets, and other space structures and even provides articles on them. It tells you when they rise, set, and the best time to view them. This app even has a compass feature, allowing you to point your phone at a star and see which one it is! 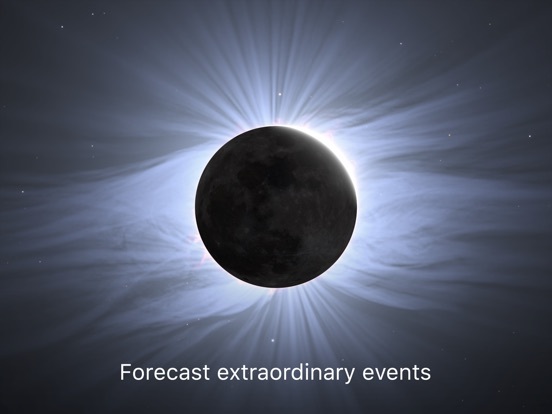 Sky Guide also has a Calendar feature that lets you know about upcoming events like what days planets will be most visible or when planets will be in close proximity to the moon in the night sky. I definitely recommend this app to space lovers like myself. I can’t get off this app! A wonderful app at an inexpensive price!! Educational and beautiful. My grandkids live it too!! A great idea and well executed. UPDATE 1/27/2019: I used to get notifications of flyovers... The ISS, Iridium flares, etc. all of a sudden, they went away! I’ve done everything is asks for and still nothing. Any chance you guys can get around to fixing this? This pretty much is an awesome app. I like that you can use it, even when you don’t have network service. There’s a group of amateur astronomers that offer a view of the stars a couple times a quarter that I love to go to. What is kind of cool, is when two of them were arguing about what a certain store appears to be. I like to whip out my app and tell them the correct answer. My only concern, I have already purchased this app. It seems to work well without the “Supermassive upgrade. I’m just wondering if the $10/yr. fee is worth it? I wish I could hear from others who have the Supermassive upgrade and get their point of view regarding it’s worth. I have used this app for about two years. Watched the ISS in Florida, Oman and the Netherlands Antilles. Discovered the existence of Iridium flares and now am so sorry I didn’t know about them until Sky Guide showed me!! The app works (not buggy) and has an appealing, intuitive and really beautiful interface. I asked their support team a question- and received a prompt and helpful reply. There is so much out there we “notice” but don’t really see! It has informative links if you want to learn more. 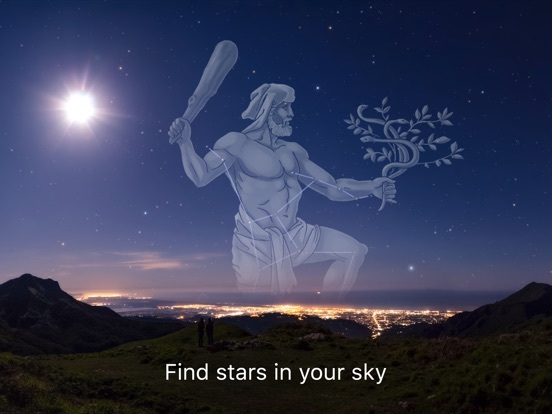 Sky Guide is home run. This is one awesome star map app! But to be honest it needs more event updates. It's very disappointing when a something cool is happening but the app does show the comet coming by. That's my only complaint. Hope they keep adding objects to there list! Love the app. Best one in my opinion! Ok update. I paid around ten dollars to use supermassive. A while back ago. Now to resubscribe. They want $19.99. This is way to much money. For something you should really only have to pay once for. I would not be so upset if they could keep the yearly subscription under ten dollars. I’m taking my five stars given. And dropping it down to three. I still feel like it is the best star map out there. And there is no reason not to download it. In clear layman’s terms, Sky Guide helps you understand the science and joy of the night sky from your location’s specific vantage point. This is especially helpful when you’re out of town. You can also use the compass setting to look “through the earth” to see what’s going on on the other side of the world. This is a beautiful and useful app. It is probably best to describe this anecdotally: I just watched PBS's new 2-hour special on the Voyager 1 and 2 spacecraft. It began giving me a sense of this grand scale of a solar system we live in... a perception only reinvigorated few times through the words of someone like Carl Sagan describing the Pale Blue Dot. I looked at my phone and immediately opened this app again to just look at space. As I wondered to my back door I realized that I was fortunate enough to be waking outside into a cloudless night. I turned on night view mode, turned down my display brightness, and let the ambient music of this app play. I was alone, along with the living silence of night with the smooth, soothing music playing on the app. I looked up with my phone, navigating amongst the constellations, in awe at how the sight could be so beautiful, seemingly unique every time, and so often taken for granted. Realizing the opportunity, I searched for satellites via the app and eagerly moved my phone around the sky to track the paths of Coos Rockets that were flying by and anticipating the next flyover from our man-made moons. As much as I adore the night sky in all its grand beauty, this app makes exploration even more satisfying, concise, and exploratory than I otherwise would have been able to do. Thank you. Had this app for a while and still my favorite. However, I’m confused about the updates. There was a recent update that added Chiron, for example, but it is not listed under the “recently added” section. Additionally, even when I look for it manually, it just points to where the object is, but there is no image associated with the description, nor can you zoom into it. At the same time, other recently added items, such as RS Puppis, has the image and location, but no description (you have to tap on the image of the star within the image - like a star within a star - to get a separate description). Doesn’t seem like the recently added section is working properly within the app. Is it just not updating correctly or am I missing something??? Also, since very recent updates, the star brightness feature that requires 2 fingers to adjust directly on the screen is so overly sensitive that I am constantly having to adjust the brightness as I navigate the sky map. Very very frustrating. Is there no way to lock that feature or disable it? Otherwise, still amazing. I effing love this app! I’ve owned this app for many years now and I have to say, this app has been absolutely instrumental in my perceptual “awakening” of this vast universe we live in. To even begin contemplating it’s size and magnificence is both mesmerizing and mind-numbing. I use many popular astronomy apps but this one gets the most use for its informational presentation and easy-to-approach UI. I continue to pay for the annual Supermassive subscription because the detail and depth is so stunning and in my opinion, completely worth it. Everyone I show it to - it takes their breath away. I know some don’t like background music in their apps but you’ll find a great non-repetitive background soundtrack in this app, if you’re into that sort of thing (I definitely am). My only wish is that they would “redden” the keyboard during a search with Night Vision enabled, and if they could audibly speak the information that they’ve curated into this app regarding all the objects we can see in our universe, because it’s nice to observe the object as you’re learning about it. Otherwise, this app is superb. 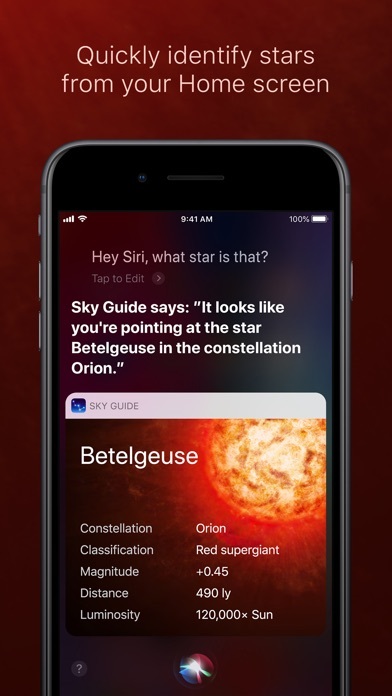 Great job to the developers of Sky Guide! Makes me forget to breathe! The sky is my first love, and a near-obsession.. so many thanks to the developers for creating this wonder; it is, in a word, perfection. The ambient music, the ease of use, the incredible amount of information, instructions all wonderful, even details of space below our horizon. I somehow relish the thought of sleeping beneath the Draco & Ursula Minor constellations, and I have to say, the visuals should be enjoyed on as large a mobile screen as possible, although it can be dizzying if you move it too quickly. It’s easy to romanticise the stars and to be in awe of space, of which we know so little...I love it, and the mysteries it holds, as it’s sometimes the only thing that makes me feel that the silly little irksome things, and nasty people don’t matter...just look up and wonder. This makes me miss Carl Sagan: “the sky calls to us, if we do not destroy ourselves we will one day venture to the stars” We miss you, Dr. Sagan, but feel a bit closer to you with simple and beautiful tools such as this one. Just remember to breathe. First of All Thanks to the Developer for giving us such a great Application Ever! But The Only Problem in lastest version is “Realtime Moving objects” like i was remember the version 6.01 in that version when we zoom the Moon so the moon will moving in realtime so reallly miss that feature in new versions i request the developer please bring that feature in upcoming version as soon as possible! Please Dear Developer Bring that feature again in option/Button type if someone want sidereal motion they can “TURN ON” and if someone don’t want they can “TURN OFF” sidereal motion. Dear Developer i am also your user i have rights to feedback , The sidereal motion was useful to us because when someone ask us how you can say that this app is a realtime app so that we can show them sidereal motion in zooming the moon like before we did in 6.0.1 version and say to them that look this is the realtime app so i request that please bring it in upcoming version as soon as possible. I Love looking at the sky, stars, clouds, etc. Found Sky Guide. Not only do I get to follow the stars, constellations, moon, sun, planets, comets, satellites, but I can go forward in time, backward in time, there is information about everything that is listed in the sky in the App and I keep finding more ways to use this app. I just LOVE Sky Guide. My friends and neighbors (most of who don't have computers nor internet connections, as I live in a village with mostly poor farmers) come over to look with me. They love knowing what is that bright star in the sky, what is the planet, etc... It is highly Educational and worth the money. And it works with the wifi off. Best. Best. Best! I fully suggest this App for a great hands on course in basic Astronomy. 5 Stars!!! And now with SUPERMASSIVE as an option, it just continues to blow my mind. Seeing the Galaxies , Nebulas, Planets up close is breathtaking. This app was definitely made by people who Love their subject. And I Love this app. It continues to be Amazing! Amazing! When I bought this app, I was expecting it to look a little bit better than the star-gazing app that I was using at the time: SkyView. When compared to Skyview, Sky Guide is clearly the more advanced application, as it has better quality. Its planet animations look stunning, along with a subtle, beautiful design to the overall app itself. 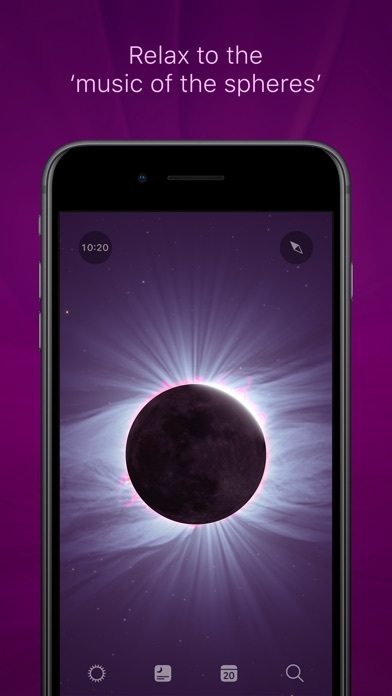 It can be seen that the app was designed with the consumer in mind due to the many features included: pinch to zoom (which displays a richer, starlit sky closer up), a filter mode (allowing the user to see the universe through different light filters such as gamma, thermal, etc. ), and finally the inclusion of AR capabilities that can map celestial bodies precisely with their counterparts within the app, gaining an immense amount of accuracy when star-tracking. All in all, I love this app and I definitely recommend it to all of those who are interested in the night sky. This app is amazing if you love star viewing! It’s really fun to pull up the app at night and to see which stars you’re looking at. It’s amazing for viewing the slow rotation of the earth too, great for getting a better understanding of that. The graphics are beautiful, but what really makes this app is all the handy features on it. Bedsides showing you which stars are where, you can also select rockets, satellites, and the space station and it shows you LIVE where it is so you can potentially see it (if it’s currently visible in your hemisphere). You can also look up upcoming meteor showers and it will tell you which way to look! You can even see different electromagnetic waves through this lens filter type thing. There’s more than that, definitely worth the $2.99, and I neeeever get anything but free apps! Want to see a shooting star? My 3 year old son and I hear an alert on my phone: 6 minutes to an Iridium Flare. He calls them shooting stars. We drop everything and run outside, rushing to the darkest spot in the neighborhood we can find. It’s not that dark, but it doesn’t have to be. We point my phone to the sky and see the path the Iridium satellite will take and watch. A bright shining light grows suddenly in the night sky right where the app points us and his smile and sense of wonder grows with it. It’s over in a few seconds but we talk about it for the rest of the night. Thank you all for this little feature in an already amazing app. Thank you for these moments, and for introducing my son to the world beyond our world. If I could give you 6 stars for this review I would. I’ve had this app pretty much since it was released. It is far and away the best stargazing/sky reference app available. It’s full of features and detailed information on everything- be it planets, stars, satellites, rockets, space debris, galaxies, constellations, etc. I recommend it to people all the time. Most importantly, when people start pulling their phones out to check out the sky at night, they always end up saying “wow which app is that?” and delete the one they had and download this one instead. That’s really all you need to know. Also something I like is that it doesn’t have the cartoonish feel of many similar apps. Really just can’t stress enough how much this app is better than the rest. I opened the Sky Guide app today after the first time in awhile. Today is January 20th, 2019 and a lunar eclipse will be visible in my area in just a couple hours. I have loved Sky Guide since the day I downloaded the app years ago. 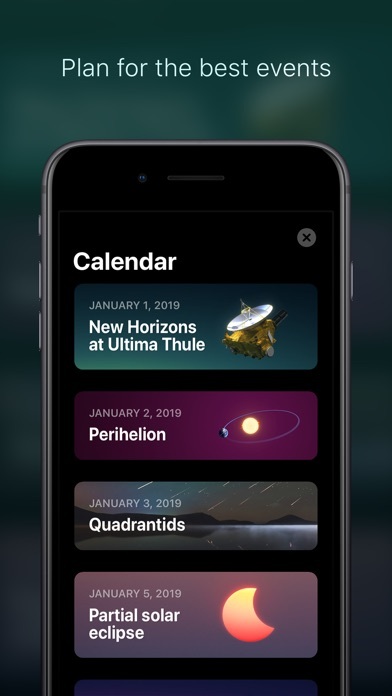 I have continued to be impressed with attention to detail the developers have added to this app and continue to use every aspect of the iPhone’s functionality to provide the best UI/UX possible for astronomy lovers everywhere. I have never really posted a thorough review of an app before on the App Store, but this app deserves way more than five stars. I am genuinely impressed time and time again every time I open the app on my iPhone XS. Thank you to the Sky Guide team for creating such a tool! Best Stargazing App By Far! This is very worth the money! I use this app everyday, and I love it. 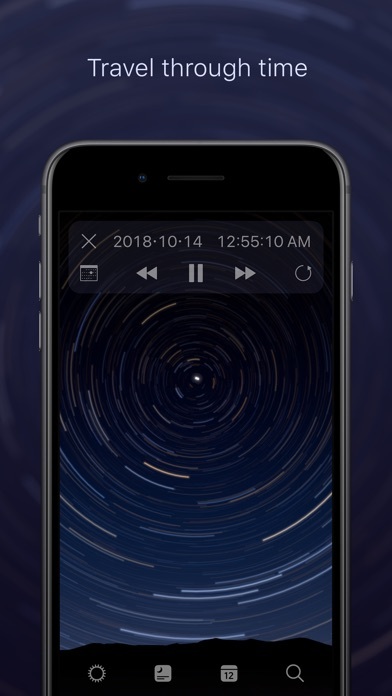 My favorite part is that just by pressing the compass at the top, you can move your phone around like you are actually looking at the night sky! 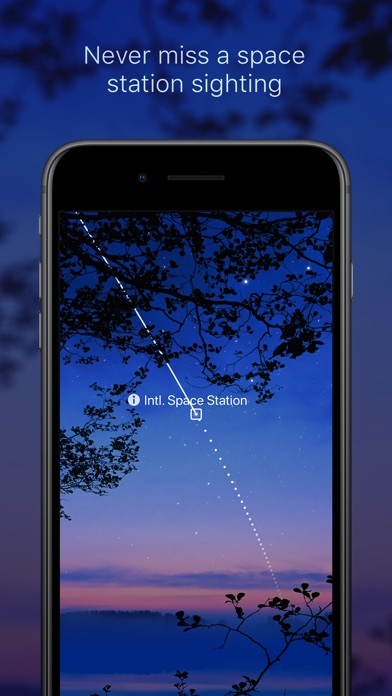 You can identify any star in the sky with this app. Not just that, you can see any galaxy, nebula, satellite, planet, star, etc. with this app. It is perfect for skywatching out on a clear and dark night. There is nothing to dislike about this app! I’m not just saying this just because I want to, I’m actually serious. 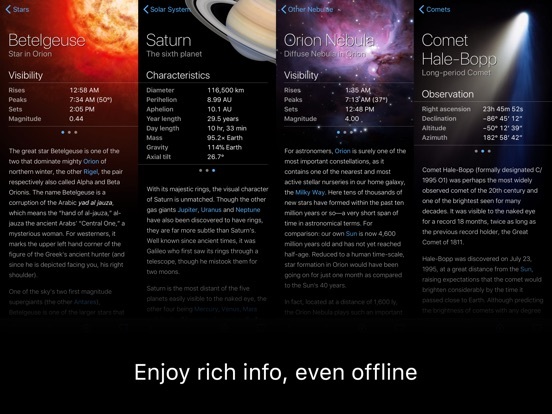 It is super informational and notifies you of passing satellites and so much more! Please buy this app if you’re looking for an amazing stargazing app. It has EVERYTHING. I recommend this app for anyone who wants to be amazed by our landscape above. It's entertaining, amusing, and educational! 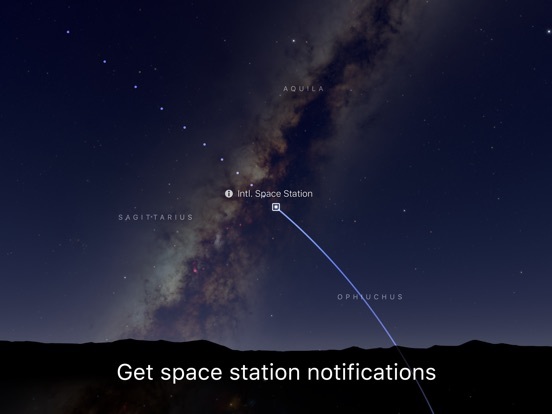 Lots of great features like you can hold your phone up to a specific light in the sky and find out by clicking on the screen what it is, or search for your favorite constellation or planet and have Skyguide point out where it is. You can also "fast forward" or reverse in time to see sunsets and paths of other objects in future or history. Great music track that feels like a live movie soundtrack while you use it. The creators of this app have really given us a treat! (Thank you guys!) My favorite app to use! Explore, teach, connect, and enjoy! 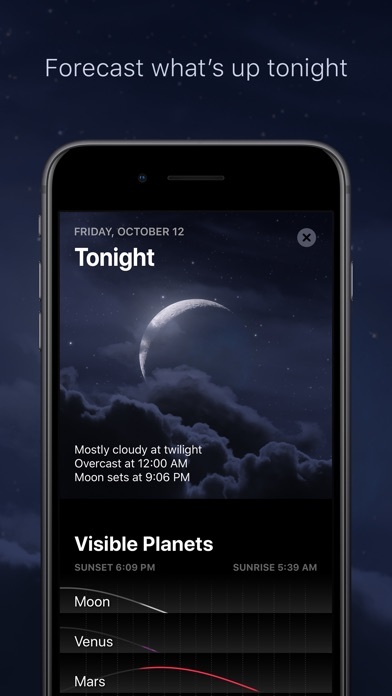 If you know the night sky, this app immediately puts details at your fingertips. If you are somewhat familiar, it will dial you in instantly. You’ll be sharing it with those around you and hear sentences starting with “I never knew...” whispered in astonishment. Set up the alerts and learn the magnificence of the ISS as it wheels across the sky. Track the planets through the summer skies. Touch the info circle next to an object and learn about Messier objects or the original Greek myths they saw reflected in their heavens. Become a citizen of the universe. This simple app has become an important part of my life that has helped bind my family together. The functionality of this app is astounding. Not only does it synch up with your location and which compass direction you are facing, showing you the sky as you hold it up and move around, but you can freeze the view, set a date and time for a view (like, your birthday) and locate specific stars, satellites, planets, constellations and other traditional heavenly bodies. I use it almost every day just to fly a little, and it tells me when the ISS will fly over and from what direction! As a science fiction writer the stats on stars has been invaluable in ensuring I don’t goof up important facts and it inspires me on dull days. No regrets, worth every penny! Since I was in second grade and went to the planetarium, the constellations held a magical fascination for me! I remember this gentleman telling the stories that went with the “pictures in the night sky” and along with his mesmerizing voice was music similar to the ethereal music with this app. I enjoy this as much as I did then and I can relive that mystical and extraordinary experience in a way with this app and it’s information for each constellation, planet, moon and every wonderful thing I see when I look into the night and this time I hold it all in my hand! I highly recommended it for stargazing and learning about the heavens in sight. To be honest, I never write reviews about anything... ever. I wasn’t sure if I’d like this app at first so I checked the reviews and so many people gave it a five star rating. Now I understand why since I’ve experienced using it myself. After downloading the app I purchased the expanded version of the app for less than $1 per month and I stayed up at night another four hours looking at stars, galaxies, nebulae, planets, and even rockets. It was such a small price to pay to be able to see everything in its real time position in the sky and I’d recommend this to anyone who has even the slightest interest in astronomy. Awesome app. I can find planets and other stars when I need to. Nicely done! Love the soothing music too. I like to know when the moon is on the rise as a photographer. No matter where I point the iPhone there is something interesting to see in the sky, even at the opposite pole. The descriptions and info on the different stars is laid out nicely. Don't hesitate to buy this app. Well worth it! 😉 5 stars!!!! ** The latest upgrade 9/17 is yet the best! Adding the live camera view of the horizon and sky gives this app another interesting dimension and way to see what is up in the sky where you are looking. I still ❤️ this app, get it - you’ll love it too. 1. My homeboy Arcturus dominates the Booty (designated Alpha Boötis, Arcturus is the brightest star in the constellation of Boötes,)!! Lol. 2. Taking 4th! Place in the Mr. Universe (literally, lol!) Brightest Star contest is quite the feat (there were only like millions of other contestants to beat)! If the contest was limited to the northern celestial hemisphere, Arcturas would take the brightest grand prize 🌞⭐️🏆... 3. I know this and lots of other interesting bits of information about Arcturus as well as many other gems in the celestial heavens BECAUSE OF SKY GUIDE! 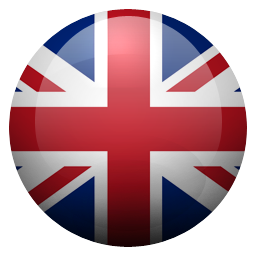 Sky Guide is a very accurate, informative and intuitive application! Now when you look up to the night sky, break out the Sky Guide app and be prepared to be amazed. Sky Guide is one of the most coolest apps out there on the the App Store. When I go out camping with my family & we soak in all the stars, the galaxy, etc. Sky guide helps us to know how far that star is & why did they name it? The most helpful & fascinating thing is that you can be able to see if there is a Satellite, space junk, or any objects floating out in space. I used to think they were all Satellites but ends up most of it is old rockets. I totally recommend this app to anybody. This really works unbelievably great on the IPhone 8! Loving the new Calendars & the light pollution on the map! I think we have all learned real quick that you never purchase an app without reading most of the reviews!! 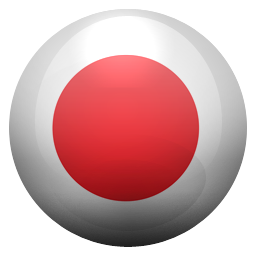 I've been using this app for a few years now and it is beyond awesome I gave it five stars because they did not have an option for 25 stars!! What is that star out there that looks so bright?? Oh that's not a star it's Jupiter.... you can set up notifications and I've seen the international space station fly by many many times it's actually pretty awesome to see how fast it does fly by!!! And these are just a few of the things that it's capable of doing!! Don't hesitate Awesome awesome app!! I was using it last night and a notice popped up saying the ISS was about to fly over. So I tracked it and to my surprise I could actually see it very clearly. I probably would have assumed it was just a plane without the app. So then I started looking for space junk of rockets and I could see a couple of those, too. This all in a major US city. Aside from that, it’s a good educational tool and I’ve already learned a lot about stars by using it. It tends to take a while for the compass to adjust but eventually it gets there and objects line up exactly. I like this App because it gives you a chance to look at the stars on a cloudy day and find all the constellations much easier though I can’t struggle with that sometimes it is amazing game for kids that are into space and science because it gives you an idea of what space looks like up in the sky and made it looks like down on the ground there are many different ways they can use this app I really like it sometimes they can be a little bit annoying but I really like how it gives me a chance to look at the stars. I did a lot of research and trying of all the star gazing apps a few years ago and this one easily came on top... years later it is several times better! I am left speechless with its current state. 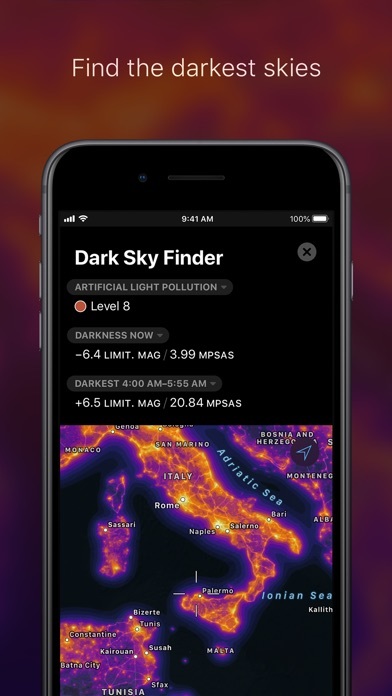 From a phenomenal night vision mode, to the apple style news that super nicely shows all events coming up as well as space related news, to a great light pollution map, to notifications, to an amazing AR mode... this isn’t just the best sky gazing app, it is one of the best APPS ever! Just so freaking great in every way at what it does. It sets a bar for all apps to follow. I love this app, and I guess it improves once in a while. The one thing that is missing in this app is exoplanets because I believe we can view all those things in this tremendous app that people have, and such as myself. I know we can’t look at exoplanet with her telescopes but I feel like we need to see everything in space besides the planets and moons we keep seeing. 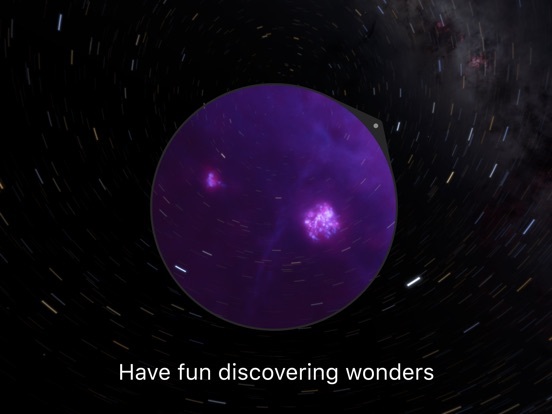 To the guys who made this app and who is updating it, if somehow you’re reading this review i hope you’ll appreciate my idea of looking at exoplanets in the sky. I've tried quite a few and this is the best! I’ve been using this app for about a month now, and can say without hesitation that this is the BEST sky guide I have found to date. The level of detail, the craftsmanship, the ease of use makes this a wonderful experience—particularly with my young child and astronomy-related projects. I installed the supermassive add on, and it it amazing. The developers have been fast with responses to my questions, and when I thought the app was not functioning exactly correctly, I discovered that not only was it working exactly correctly, but in an intuitive way. The ISS went over my home last night, and I was surprised not to see it. After an email inquiry, I learned that the app shows the relative brightness while the satellite can be seen, and fades out the satellite when no longer sunlit. I backed out the time to last night and was blown away by how it works so well. Amazing work! I only wish I had this app when I was a kid. This app is so overwhelmingly powerful and deep! I’ve had it for a year and I’m still amazed by it every time I use it. I may be their best salesman as I tell everyone about it. On my iPadpro it’s even more exciting to use. The absolute only thing I suggest is for the notification of unusual events be increased to maybe 15 minutes instead of 5. I miss stuff because of that. But still, the information content and user friendliness is enormous. Can’t believe it doesn’t cost a lot more. Fantastic. I love being notified of when the international space station is about to pass over-head in the night sky. It is the thing my childhood dreams were made of back in the 1970’s. On our evening walks, it is cool to get notified to look up and see an iridium satellite flare. I appreciate the red night screen that protects our night vision when using this app out in the field with our telescopes. The back ground music is beautiful. I appreciate everything about this app. I still have much to discover. UPDATE! I was able to open the app and viewed the ISS tonight. Not sure why it wouldn’t work before as I didn’t do anything different. Thanks for your concern. This was the very first app I purchased when I bought my iPad. Love all your improvements. So disappointed that I can no longer use an app I purchased because my phone is the 5se. It still works on my old iPad that is too old to upgrade to ios11. What gives? Hope you can find a solution for the many people who can't afford a new phone. Incredibly informative, functional, fun and immersive. I could (and often have) gotten lost in this app for more than an hour, and I mean that in a good way. As an astrophotographer, I use this app primarily to see where the Milky Way will be and where the moon will be in relation, but it was also a huge asset in shooting the total eclipse in August. I love playing around in the app and learning about what's out there. I recommend this app to all my friends who are getting into astrophotography. I wouldn't trade it for anything else! A friend of mine suggested this app, and I’m a penny pincher, so the three bucks made my finger quiver at purchase. But to my surprise, this app was insane! It wasn’t some dinky “this is a star” type of app, but it enables the user to pin point the exact position of every star and constellation. I was so blown away by the AR mode that I couldn’t put my phone down. Being able to find the close stars and the planets was a great educational tool for my kids as well. This was probably the best three bucks I have ever spent on an app! This is definitely one of the coolest and most informative apps I have downloaded yet. The graphic are absolutely stunning and it has easy navigation that anyone can use. I’d definitely recommend this to anybody with interests in astrology or astrophysics. The only recommendation I would have for the makers is to add more deep space objects in the future. It is very interesting to see the different galaxies, but there could definitely be more added to enhance it. Other than that, it is the perfect sky app for both amateurs and professionals. AR stopped working on my 6s Plus after the latest iOS update. It worked fine with 11.0 but either 11.0.1 or 11.0.2 killed it. I just installed the most recent update for the app and it didn’t solve the problem. Please fix soon. UPDATE: Thanks for getting back with me. 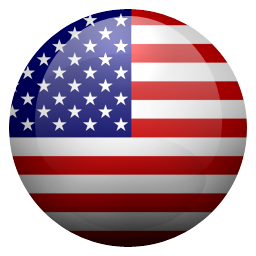 After turning Compass Calibration back on under Settings>Privacy>Location Services>System Services, all is well. Not sure why this affected AR but it works now.